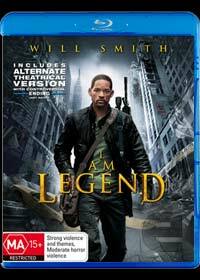 I Am Legend is based on Richard Matheson's 1954 novel of the same name and stars Will Smith as our pragmatic hero Robert Neville, a US Army virologist who believes himself to be the last human alive after a mutant strain of the measles virus (masking as a cure for cancer) which decimates the human population. The story begins with the quarantining of New York City and director Francis Lawrence masterfully uses flashbacks to tell the tale of how this disaster occurred. In the present, Neville and his loyal dog Sam search the city for survivors during the day and hopefully a cure for this malignant virus. Unfortunately for Neville, this virus has caused the survivors of humanity to be turned into murderous vampire killers as he carefully balances a game of sanity versus insanity. Without spoiling this impressive film, Smith is brilliant in I am Legend as his sidekick Sam who work extremely well together and are both quite believable. Will Smith plays a likeable and humanistic character whom the viewer automatically has a relationship with and best of all, this current incarnation also contains the controversial ending, unlike the original theatrical version which did not give the movie a true sense of closure. The movie is a great ride from start to finish and match that with some state of the art special effects and this is the perfect Hollywood blockbuster movie come to Blu-Ray. The video quality of I Am Legend if phenomenal with high definition video footage that is exceptionally sharp with vibrant colours. Some scenes in the movie are truly awe-inspiring as the attention to detail is quite amazing. The movie also comes with Dolby TrueHD which makes good use of the bass and speakers which means if you truly wish to experience this movie as it was made, you need a decent surround sound setup as the audio is exceptional. For lovers of special features, I Am Legend contains both versions of the movie and some interesting animated comics, a great featurette entitled "The Science of I Am Legend' that gives a create insight into the science behind the movie and "Creating I am Legend" which is documentary of the making of this film. We could easily recommend this movie to all action/adventure movie buffs and what really sets this film apart from the market at the moment is the outstanding video and audio quality plus a great story that had me drawn in from start to finish.